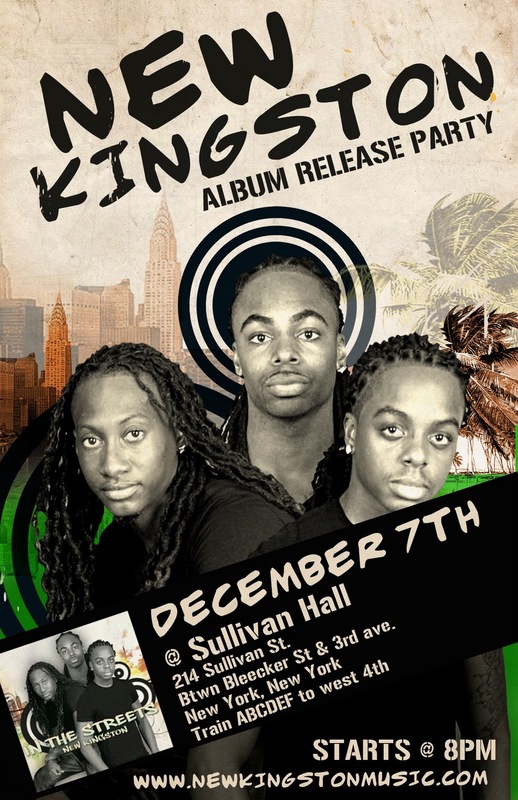 On Tuesday, December 7, 2010 at 8pm, NEW KINGSTON takes center stage as young leaders of the next music generation with a Sullivan Hall media debut of their highly anticipated sophomore album - In The Streets. 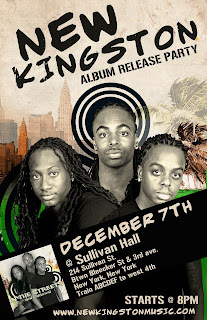 Headlining Sullivan Hall’s media premiere (located at 214 Sullivan Street between Bleecker Street and 3rd Avenue), NEW KINGSTON plans to pull out all the stops. Filled with explosive raw talent and unique creative expression, NEW KINGSTON is poised to continue a musical legacy that spans more than four decades. Featuring live performances from the Caribbean’s finest artists, the opening line-up includes lovely ladies, Keisha Martin (Gangsta Shorty, Believe), Marcia Davis (Young Man, Too Much War), Sweet Tea (Hit de Road, Thank You Father), Lady Alexis (Nah Nah, Broken Promises), Alibra (Love Found Me, Clearly), Nicole Williams and Afiya Wilson (Love Anthem). This is one jam session you won’t want to miss. Autographs, photo opportunities available and CD’s will be on sale. Doors open at 7pm. Showtime at 8pm. Free admission. Led by father and veteran Reggae musician/producer, Courtney Panton, this multi-talented “band of brothers” have been performing together since 2003. Members of NEW KINGSTON are Tahir (Keyboards/Vocals), Courtney (Drums/Vocals), and Steve (Guitar/Vocals). In a class all by themselves, NEW KINGSTON carved their niche early by perfecting their ability to perform Roots, Rock, Reggae, Soca, Pop, Jazz, and R&B ultimately raising the bar for crossover fusion within the Reggae music industry. In 2005, New Kingston released their first debut album entitled Mankind featuring hit single This Love Is; and collaborations with the legendary Frankie Paul, Ritchie Stephens, Bushman and KC Jockey (available at CD Baby and I-tunes). Their new album, In the Streets, include chart topping hit singles Pon’ di Wall, In the Streets and Empress Love. Equally successful are their latest videos entitled In the Streets and Empress Love, both of which have received heavy rotation on a variety of channels throughout the world. Over the years the group has worked with many artists to include Shabba Ranks, world renowned Jazz pianist Monty Alexander, Ky-Mani Marley, Collie Buddz , Mr. Vegas, Alton Ellis, Richie Spice , Morgan Heritage and Sister Carol. Tours include the USA, Europe, South Pacific, South America and the Caribbean. Awards: the 2009 International Reggae and World Music Award for Best Backing Band. Currently NEW KINGSTON is on tour with Collie Buddz.